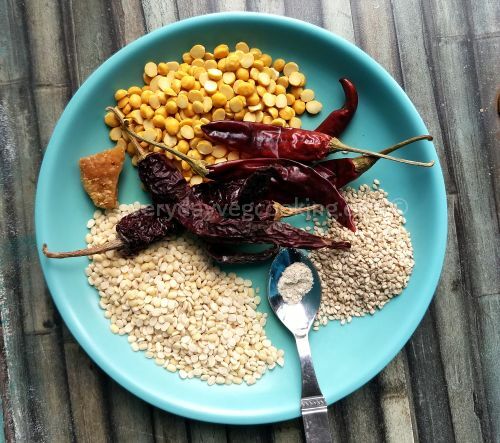 Milagai podi, (slang – Molaga podi), the lentil-chilly dry chutney is populary known as Gun Powder, for the spicy punch it packs in every bite. It is enjoyed by the connoisseurs, even if it brings tears to their eyes! In many south Indian homes this spicy chutney powder is the only accompaniment for idlis and dosas as it is prepared and stored for easy use. All one needs to do is to add some til (sesame) oil to it and mix, for a spicy accompaniment. My younger son can’t relish the idlis or dosas without milagai podi, even if I have made coconut chutney and sambar to go with them. I know of people who like to sprinkle it on upma and pongal for that added zing. Some even mix it with rice, with a dollop of ghee to satiate hunger pangs instantly. Suffice to say that milagai podi is a favourite staple long-shelf-life-chutney-powder in most south Indian homes. It is called chutney pudi in Karnataka and idli karam podi/pappula podi in Andhra/Telengana. The ingredients, taste and flavour vary from region to region. Even in the Tamilian version of milagai podi, there are many variations. Some recipes have dhania and garlic too. What I am sharing here is the one I make at home. You can make it in a jiffy with just a handful of basic ingredients, easily available in your pantry. Do make a batch of it and store it, considering it has other uses besides being a side dish for your breakfast. Take a heavy bottomed kadhai and heat ½ tsp oil. Add chana dal first and saute for 2 mins. Now add the urad dal and saute both till they turn golden brown and aromatic. Add the hing and remove to a plate. Now in the same kadhai, add ½ tsp oil and saute the chillies till they puff up and are well roasted. Remove, and add to the dals. Next, roast the til till it begins crackling and emitting a roasted aroma. Don’t brown it. Remove and keep in a separate plate. Once the dals and chillies have cooled, grind to a coarse powder. Grinding it coarsely gives it a bite. Add the til, salt and jaggery and pulse for 30 seconds. The til should not be ground fully since it adds an interesting texture to the molaga podi. Serve with steaming hot idlis and crisp dosas. Milagai podi is traditionally mixed with til oil while serving. However, mixing it with ghee also is a wonderful option. This chutney powder is a great blessing for train travels and lunch boxes. 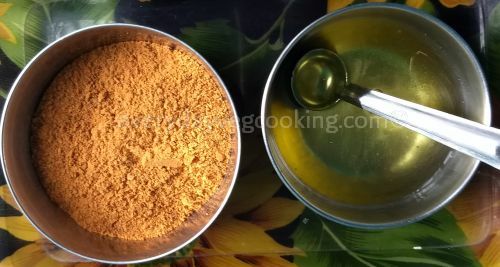 Take 3-4 tsps of milagai podi, mix with a generous quantity of til oil and smear this mixture over idlis. This masala idli keeps for a day and becomes very tasty after some hours and therefore a great food to carry on travels. The oil helps to keep the idlis moist and soft. I add a tsp of this powder to fried potato curry towards the end, for an interesting twist of taste. I had no idea it was this simple to make! Will make this for sure! Thank you! By definition, whatever recipe I share has to be easy-peasy. Did you expect me to share anything difficult or complicated? Seriously though, this is a good chutney powder to keep on hand and can be used as garnish too! Thanks you. Since it is very simple both in terms of ingredients and preparation, it can be easily prepared in a jiffy. 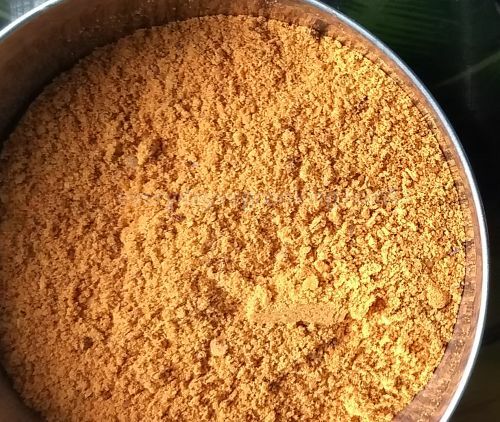 With such simple ingredients you have made such a exotic podi, we all enjoy this with South Indian dishes and sometimes I relish this with paratha too.